Neurons maintain their negative resting membrane potential with the help of two-pore-domain potassium (K2P) channels, which let potassium ions leak out across the plasma membrane and thus control cell excitability. Two papers published in Science on January 27 reveal the first X-ray crystal structures of the so-called potassium “leak” or “background” channels, both from humans. Roderick MacKinnon and colleagues at the Rockefeller University, New York City, US, report the structure of one K2P family member; Alexandria Miller and Stephen Long at Memorial Sloan-Kettering Cancer Center, also in New York, show another. Several K2P channels are emerging as potential players in pain sensation and chronic pain, and the structures suggest how this unique family operates and how the channels might be regulated. Among neuronal ion channels implicated in pain, K2Ps are the new kids on the block. “It’s a very young field…. But it’s fundamental to the excitability of the cell,” said Sally Lawson, University of Bristol, UK, who studies K2P channels but was not involved in the structural work. She hopes that the new structures will help researchers dissect the functions of K2P channels, and target them to treat pain. K2P channels are regulated by a variety of factors, including membrane lipids, pH, mechanical force, and temperature. They are the targets of pungent chemicals in Szechuan peppers and volatile anesthetics like chloroform (for a review, see Enyedi and Czirják, 2010). Two K2P channels, the TWIK-related K+ channel 1 (TREK-1) and TWIK-related arachidonic acid-activated K+ channel (TRAAK), appear to dampen pain signaling in mice: Knocking out either channel renders dorsal root ganglion neurons hyper-responsive to heat and produces mechanical allodynia and hyperalgesia. The mouse work suggests that K2Ps counteract the excitatory effects of transient receptor potential (TRP) channels, so that together the channels tune the cells’ response to environmental inputs (Alloui et al., 2006; Noël et al., 2009). In rodent models of inflammatory and neuropathic pain, K2P channel expression drops, suggesting that dysregulation of the channels may contribute to persistent pain (La and Gebhart, 2011; Marsh et al., 2012; Tulleuda et al., 2011; Descoeur et al., 2011). In humans, a loss-of-function mutation in the K2P channel TWIK-related spinal cord K+ channel (TRESK) has been linked to familial migraine with aura (Lafrenière et al., 2010). The architecture of K2P channels is distinctive—most potassium channels are tetramers, but K2Ps are dimers in which each subunit contributes two of the four required pore-forming domains. The new structures, of the TWIK-1 (Tandem of P domains in a weak inward rectifying K+ channel-1) and TRAAK proteins, reveal a novel extracellular cap domain that largely blocks the channel and steers ions to a side entry to the pore. 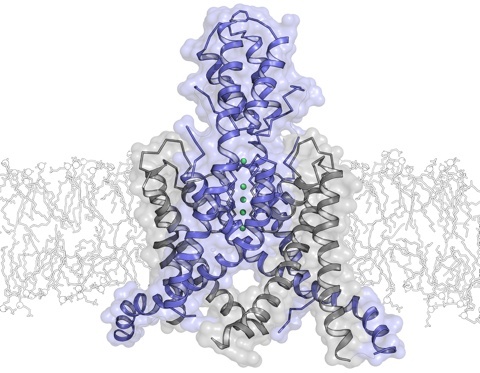 The structures suggest features that may help keep the pore open, and membrane-interacting domains offer potential sites where membrane lipids and mechanical force might regulate channel opening. Gaps in the walls of the pore may allow hydrophobic compounds to access the pore from within the membrane. Because the K2P family is large and diverse, a crucial challenge for research is to distinguish the functions of the different channels, Lawson and her colleague Cristian Acosta told PRF. Work on the K2P family has been hampered by the lack of channel-specific agonists or antagonists. Lawson and Acosta hope that these initial K2P pictures will be followed by additional structures, and by the development of specific channel modulators that can be used to define the roles of the channels in pain. With luck, the study of K2P channels might one day yield up a new class of pain-fighting drugs. Science. 2012 Jan 27; 335(6067):436-41. Science. 2012 Jan 27; 335(6067):432-6. Structural biology. The inner workings of a dynamic duo. Science. 2012 Jan 27; 335(6067):416-7.